YogaTrail is "the World's Yoga Network". But what does that mean? Well, it depends on who you are and what you do. For yoga students, YogaTrail is simply a way to keep up with their own yoga world and with what's going on in the community. 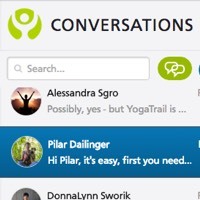 For yoga professionals, YogaTrail is a free platform that provides you with tools to manage your business and keep your yogis in the loop about your classes, upcoming events, and general happenings. When you publish your classes on YogaTrail, your students are subscribed to your schedule and get all your classes in their Class Guru. You can also use the YogaTrail Schedule Widgets to display your schedule on your own website. Anytime you cancel a class, or when your schedule changes in some other way, your students are notified (with your permission, of course). Those with the YogaTrail App on their phone get instant notifications. The YogaTrail Messenger is specifically designed for yoga professionals. You can send out announcements to all students, but when someone replies, it's in a private (1:1) chat with you. No irrelevant mass conversations! The Messenger is the best way to communicate directly with your clients and let people know what's happening. Your yogis don't even need to be on YogaTrail — the ones that aren't will simply get your message in the form of an email. You can take bookings for all sorts of things: classes, upcoming events, private lessons, and more. 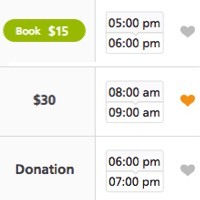 Yogis can book classes with you not only on the YogaTrail website — but with Schedule Widgets, you can also let people signup for classes directly on your own website. On YogaTrail, you use your very own merchant account with Stripe, so all payments flow directly into your bank account. That's great for you, but it also means you're in charge of refunds. But the main mission of the YogaTrail platform is to connect you with your students.